Rock With Me Baby is the comforting addition to this awesome, down-home blues artist's sparsely-documented career. A fire that cannot be faked or accurately imitated fuels each note and puts this title in perfect fit with APO Records' mission of finding "the real blues." Recently deceased at 81 years old, Little Hatch is a little-known legend; little-known, that is, outside of Kansas City, where his birthday was long ago declared "Little Hatch Day" and where harp up-and-comers actively pay homage to the master. Little Hatch, born Provine Hatch, Jr. in 1922 in Sledge, Mississippi, began blowing the harp obsessively at 8 years old and came under the direct spell of Sonny Boy Williamson II and Howlin' Wolf when his family moved to Helena, Arkansas in 1935. Sonny Boy became Hatch's hero, and from there, another sure-fire bluesman was born. Rock With Me Baby oozes with blues purity and recalls the gritty roots of a time before blues needed polish to shine. If Hatch's harp is technically imperfect, his soulful voice is unmatched. Fans of the real thing will drool, and rockers may at least understand blues heritage through this release. Jimmy D. Lane and Ron Edwards accompany Hatch on guitars. The trio lays down 13 tracks of exquisite traditional blues that's a treat to both ears and soul. Lane is of course son of blues legend Jimmy Rogers, and he's a fast-rising star in his own right with two great releases on the APO label and a third soon to come. Edwards has been playing sweet-sounding slide guitar for more than 30 years, having been tutored by such slide luminaries as Houston Stackhouse and J.B. Hutto. His regular gig for 15 years now has been as accompanist to St. Louis bluesman and APO recording artist Henry Townsend. 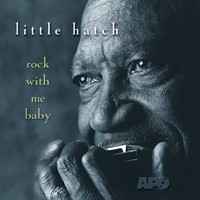 Rock With Me Baby, Hatch's second APO release, is surely his best album to date. (3 Stars) 1 person(s) rated this product.